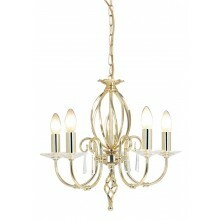 This product is an elegant indoor chandelier featuring eight candle style lights in an aged brass finish. 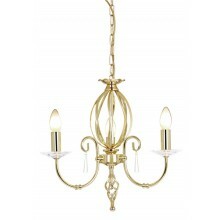 Its design is simple but elegant in nature, consisting of a twisted brass base and curled arms with individual detail work extending from the base to hold the candle lamps. This is suspended by a chain from a simple ceiling mount. 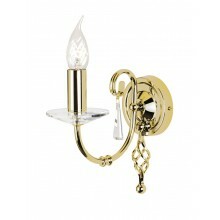 This lamp would create an imposing yet stylish and versatile look in any room in which it is displayed. 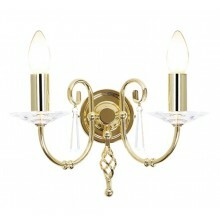 It would be perfect for use in a living room or sitting room area, or above a formal dining table. With eight 60w bulbs, it is sure to light up any space.